Yesterday, I wrote on my FB page saying that ‘spring is coming eventually’. However, a friend replied, ‘well, spring is still so far away’, since over here, it is really cold, and snow covers most parts of England. But in Chinese culture, even it is called ‘Spring day’, (or the beginning of the spring’), it does not really mean that we can have the ‘spring weather’ already. It simply means that we can feel the signs of that spring breeze, and see the spring greenish is starting to come. In the next 15 days, there will be dramatic change in nature. In ancient China, these 15 days are divided into three parts, each five days as one part. The first five days means that wind is originated from the east now, the frozen ground is gradually defrosting; the second 5 days means that hibernating worms and animals are waking up from their caves; the third 5 days means that the ice in the river is starting melting, fish begin to float up to swim towards the surface. This is why Chinese people celebrate the ‘Spring Day’. Thus, ‘Chun’ / ‘Spring becomes a very ‘happy’ or ‘blessed’ word. 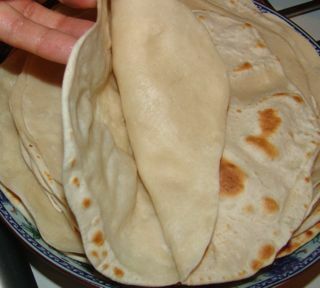 The food for celebrating the Spring Day is called ‘Chun bing’, as in ‘Spring flatbread’. 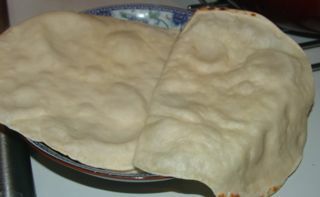 It is actually really simple — very thin soft flatbread rolled up with different fillings. To describe what it is like, I think the best way is to show you how to make it. :) Here you go. 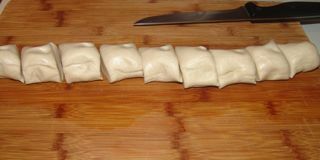 2) After leaving the dough to settle for around 30 minutes to one hour, roll the dough into a ‘tube’. 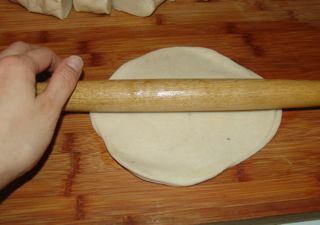 If the dough is sticky to your hands and the board, rub a little bit oil to the surface, better not the dry plain flour. 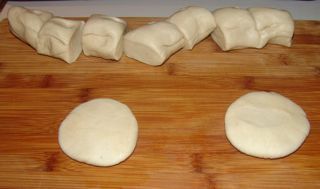 4) Take two small doughs, and press them flat in round shape. 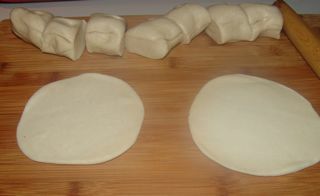 5) Roll the flat doughs couple of times by using a rolling pin, make them a little bit bigger. 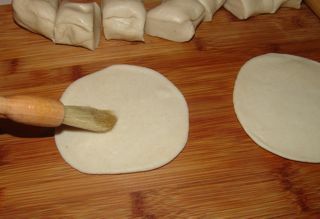 6) Evenly brush a bit oil on one of the flat dough. 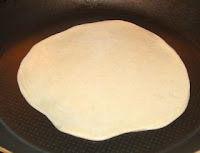 7) Cover the oily surface by another flat dough. 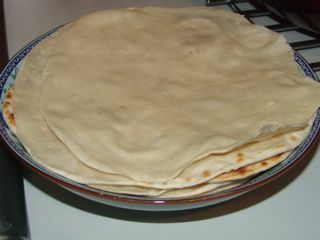 8) Then roll the two (together) into a very thin flat sheet. 9) Place a flat sauce pan on the medium to low fire. When the sauce pan is heated up, place prepared ‘flat sheet’ into the sauce pan. 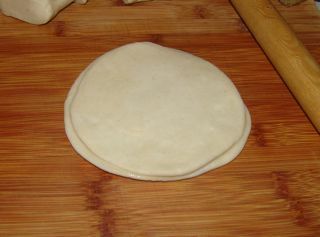 11) Once it is done, remove the flatbread to the plate, and carefully separate the two layered flatbread from the edge. Ok, now let’s move on to the fillings. I actually just realized that there are so many different fillings for the Spring flatbread, when I looked up online. Different regions have different traditions of making the fillings. For example, stir-fried bean sprouts with meat mince, stir-fried (shredded) lamb meat with scallion, or even some salad (liang cai) all can be used for the filling. But in northeast of China, the most common ones are what my mum usually prepares — stir-fried shredded potato and stir-fried bean sprouts. I have talked about the stir-fried shredded potato in the previous post. 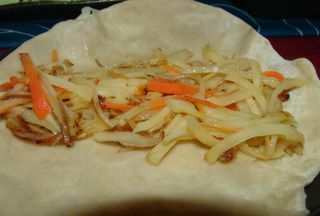 Let’s just pretend we are having stir-fried shredded potato for the filling, now we roll it up for eating: Place one flatbread on the plate, and place reasonable amount of stir-fried shredded potato in the middle of the flatbread, then roll it up. According to the traditional saying, it is important to finish it from one side to the other, means that from the beginning to the ending — metaphor that you are going to do things thoroughly in the new year.